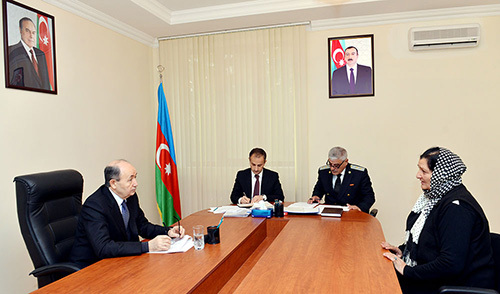 In accordance with the President Ilham Aliyev s assignments related to decent service to the people, care and sensitive approach to citizens appeals, meantime full ensuring of the principle of justice by state bodies,the Ministry of Justice keeps constant attention in reception of the citizens in the regions. In accordance with the schedule of the heads of central executive bodies on citizens reception in the cities and regions, the Minister of Justice, Chairman of Judicial-Legal Council Fikrat Mammadov received citizens living in Yevlakh, Bardaregions and Mingachevir city in Yevlakh region, on November 25. Before the reception the Minister and the head of Executive Power of Yevlakh city Goja Samedov visited the monument to national leader Heydar Aliyev, laid a bunch of flowers and expressed deep respect for the memory of the great leader. Expressing their satisfaction for the creation of convenient and favorable conditions for local residents to receipt and review applications on the spot, citizens expressed their gratitude to the President Ilhamn Aliyev for his care and attention. During the visit, the Minister of Justicehas acquainted with the activity and working conditions of local judicial and justice bodiesand held meeting with judges and justice employees.